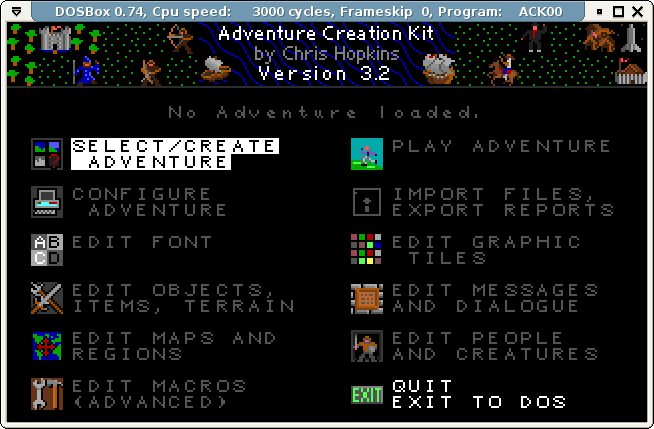 The Adventure Creation Kit is a visual tool for making RPGs in the style of old Ultima games, running in DOS. And while that style of game ultimately lies outside my sphere of interest, I couldn't resist taking a good look at ACK. Here's what I discovered. The main screen seems daunting at first, but prod it a little and it will start to make sense. Skim the manual too, it's only 45 pages. The UI is somewhat inconsistent (you quit some tools with Esc, others with F10), but overall well-designed, especially as it has to fit in 320x200 pixels. We're truly spoiled nowadays. Any game you make will have the same rules and commands -- your players won't need a manual, it's very intuitive. Everything else can be changed: fonts, HUD, you name it. And you have plenty of wiggle room to make art in your very own style. Usefully for the modern era, you can also import assets; the formats supported are very specific, but commonly used and well documented. ACK ships pre-packaged with DOSBox for Mac and Windows, but I ran it manually in Linux. It works just fine with the default configuration. You can also package your own games for distribution: the interpreter is just another tool in the suite. It's a good idea, really. I thought of porting my own games to DOS for the same reasons of excellent portability, but various inconveniences prevented me. If a retro-style Ultima pastiche is your dream game, then ACK is your dream tool. Sadly it's not mine. But it did give me some ideas. And now for the other big news of last week: I'm famous! Or at least more so than before Escape From Cnossus was featured on a couple of retrogaming blogs. Indie Retro News even has a very nice review that riffs hilariously on the game's premise. Thanks for the laugh, man! And sorry for all those crocodiles, I just didn't have room to code edge case safeties. More quietly, Vintage Is the New Old bring to the table a gameplay video of both games in the series, without any commentary. So go and watch! In the miscellaneous category, over at Rock, Paper, Shotgun Michael Cook continues his series of articles on game AI. And just as I'm looking into digital typography again, Andrew Plotkin publishes the source code of his latest game as a print book. An unusual way of showcasing the unique nature of Inform 7, to say the least. I'll conclude with another game listing, this time of Android games with gamepad support, and not just for the Ouya or similar consoles. I didn't think there were that many, since Android typically runs on touchscreen devices. But those can take ordinary peripherals, and it looks like many developers wanted to take advantage of that, the same way I went through the trouble of adding gamepad support to my HTML5 games. Keyboards and mice are fun, but some of us grew up with arcade games and the (S)NES, and that's not easily forgotten. Have a nice week... what's left of it when you're reading this.